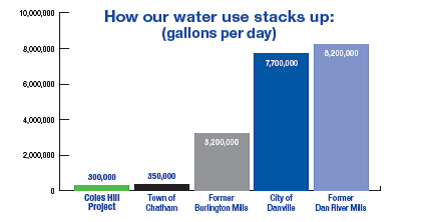 The mining and milling operations at the Coles Hill project will use on average 300,000 gallons of water daily (Marline 1983, Lyntek 2012)—slightly less than the nearby Town of Chatham, which has about 1,200 residents. Rain water and water collected from the site will feed the mill’s water system, and all water will come from the 3,500-acre site. Virginia Uranium (VUI) will recycle as much water as possible in order to minimize disturbance of the land and reduce costs by conserving the use of chemicals required for the milling process. A water treatment system comparable to municipal systems is requiredon site. Current designs show that the plant will be capable of handling 158 million gallons a year. (VUI’s projected annual water usage will average 110 million gallons.) , The plant will test all water on-site and treat it as needed to reach EPA standards before it is recycled or released back to the environment. The company, independent laboratories, and government agencies will conduct water testing. In addition, most companies, including Virginia Uranium, invite environmental groups to conduct their own testing at the company’s expense. The Nuclear Regulatory Commission (NRC) requires that wells used for potable water supplies, watering of livestock, or crop irrigation within a 2km radius of any tailing cell be tested quarterly (See NRC Regulatory Guide 4.14). These private wells and public water supplies in the area will be tested for at least a year to establish existing baseline levels of water quality before any mill permit is granted. Controls of contaminants and monitoring of Points of Compliance around the project area will provide multiple safeguards against release of contaminants from the site, with ample time to implement corrective actions if contaminant levels should rise above Maximum Concentration Limits set by the NRC. Under federal regulations, VUI will be responsible for any remediation or replacement of contaminated wells. Lyntek, Inc. and BRS, Inc. 2012. C.H.U. Project Pittsylvania County, Virginia Scoping Study and Cost Estimate. Lakewood, Colorado. Marline Uranium Corporation and Union Carbide Corporation. 1983. An Evaluation of Uranium Development in Pittsylvania County Virginia, Volume 2. Nuclear Regulatory Commission. 1980. Regulatory Guid 4.14, Revision 1, “Radiological Effluent and Environmental Monitoring at Uranium Mills”. Washington D.C.